Creative Business Cup is a competition where business start-ups in the creative industries go up against each other for the chance of ultimately calling themselves the world’s best creative entrepreneurs. Our very own director Simon Drewsen Holmberg has been among the jury of the 2018 national cup which was split into three stages – applications, semi-finals and finals. The first step was deciding which of the competition applicants qualified for the Creative Business Cup Latvia semi-finals based on the creativity, uniqueness, innovative power and market potential of their business idea and company, the skills and knowledge of their team and their ability to assess risks. The halls at the coworking and experimental space “Teikums”, where the semi-finals were held, were packed with creative people and business experts as the participants pitched their businesses and answered questions from the jury. After hard deliberations, five winners were chosen to compete in the national finals. These were held as a part of the New Realities. Creative Industries Forum along with the first ever held Creative Business Cup Baltic Sea Region competition where creative start-ups from not only Latvia but from the whole region met to network and compete against each other. The Forum included talks about the future of creative industries by internationally renowned experts, among them Rasmus Wiinstedt Tscherning, founder and Managing Director of Creative Business Cup and board member of the Danish Cultural Institute. 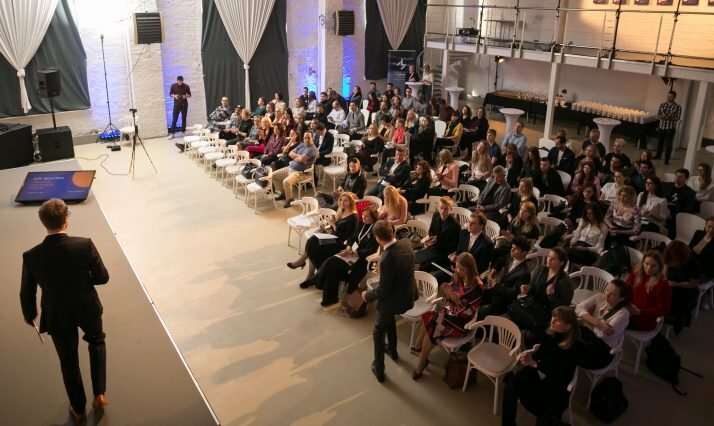 In addition, Forum guests and contestants had the opportunity to hear success stories from Latvian entrepreneurs such as WARP, Every Little Thing and Anatomy Next as well as participate in the creativity week radi!2018 conclusion discussion titled “Radi-dari” (Create-do), focusing on the culture of failure. Pitching and presentation expert Gleb Maltsev held a workshop on creating memorable presentations, and the Forum was concluded by a surprise performance where participants could step into and explore a virtual reality environment created in real time by a professional VJ and screened on stage. The three driven and talented winners of the national finals, Gamechanger Audio, CheeksUp and Castprint, will travel to Copenhagen at the end of November to compete in the global finals. Here, they will have the chance to win prizes, engage in workshops, pitches and inspirational talks and to meet and network with world-renowned investors, entrepreneurs and key players in the creative sector. DCI wishes them the best of luck in Copenhagen, and we hope that all the contestants have enjoyed the journey so far. We are proud to have been a part of launching Creative Business Cup in the Baltics, and we hope to see many more ambitious and innovative creatives participate in the coming years.